*BREAKING NEWS: MICHEL MARTELLY ELECTED PRESIDENT OF HAITI! MICHEL MARTELLY ELECTED PRESIDENT OF HAITI + GRACIA DELVA WINS HIS RACE! *MARTELLY ELECTED PRESIDENT OF HAITI! *GRACIA DELVA WINS HIS RACE IN HAITI! 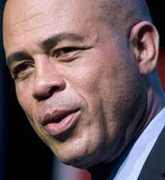 *NEW YORK TIMES proclaims Martelly as new Haiti President!